Ministry of Earth Sciences has unveiled state-of-the-art Air Quality and Weather Forecast System– SAFAR (System of Air Quality and Weather Forecasting) at Chandni Chowk in Delhi. It is a first of its kind and most advanced system in India. Such advanced systems are also proposed to be implemented in other three cities of India- Pune, Mumbai and Ahmedabad. 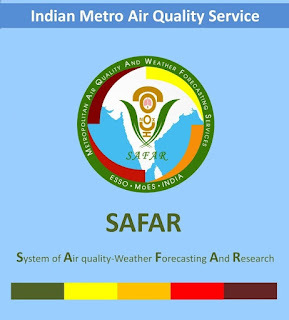 SAFAR was developed indigenously by the Indian Institute of Tropical Meteorology (IITM), Pune and operationalized by India Meteorological Department (IMD). It is an integral part of India’s first Air Quality Early Warning System operational in Delhi. It will monitor all weather parameters like temperature, rainfall, humidity, wind speed and wind direction. It will also measure Sun’s UV-Index (UVI), PM1, Mercury and Black carbon in real time in addition to regular air quality and weather parameters like PM2.5, PM10, Sulfur Dioxide, Ozone, Nitrogen Oxides, Carbon Monoxide. It can also provide measurement of online automatic ultrafine particles PM1 and Mercury, both of which have direct relevance to human health. It will also monitor existence of harmful pollutants of Benzene, Toluene and Xylene. SAFAR has a giant true colour LED display which gives out real-time air quality index on 24×7 basis with colour coding alongwith 72-hour advance forecast. Based on the Air Quality Index on particular day, health advisory and related precaution will be notified to prepare citizens well in advance. What will be the benefits of SAFAR? SAFAR will accelerate public awareness and preparedness of air pollution and weather extremes. It will also lead to better understanding of linkages among emissions, weather, pollution and climate. It will strengthen existing air quality network of SAFAR, Central Pollution Control Board (CPCB) and Delhi Pollution Control Committee (DPCC). Besides health, SAFAR system will benefit cost savings to several other sectors like agriculture, aviation, infrastructure, disaster management skill, tourism and many others, which directly or indirectly get affected by air quality and weather. Q1. What is the Air Quality and Weather Forecast System launched by the Ministry of Earth Sciences, called? Q2. Where is the Air Quality and Weather Forecast System launched?